Forty years ago most observers would not have given the Rev. James Gibbons more than ten years of life. Although a healthy man, his frail appearance suggested an early departure from this world. Yet the cardinal has arrived at threescore and ten with a buoyancy of spirit and elasticity of limb worthy of the most robust. He is so thin that age does not show its prog­ress on his attenuated form. It is the common opinion of his friends and neighbors that he may rival the years of the late Pope Leo without perceptible change. In clerical circles a good story of the contrast between the cardinal and the massive Archbishop of Philadelphia has been told. The two prelates were bathing at Cape May, in the regular bathing-suits, Dr. Ryan large and resplendent, and Dr. Gibbons lean and insignificant. "What a splendid man," said a lady on the beach, as she gazed on Dr. Ryan, "and what a misfortune to see him mated with such a miserable creature of a wife!" Unfortunately, the cardinal has de­nounced this story on three grounds: He has never bathed at Cape May, he has never bathed in company with Dr. Ryan, and he has never taken a sea-bath. The simple life may take the credit of Cardinal Gibbons' longevity. He has been a steady worker, and for the better part of his life in trying conditions. He traveled the Carolinas when railroads were unknown, and the bridle-path did duty for the road. Missionary life in that region has always been full of hard­ship, and the future cardinal had four years of it as a traveling bishop. His lot enjoyed some improvement when he was made Bishop of Richmond in 1872. Glory fell upon him in 1877, when he was named as assistant to the Archbishop of Baltimore, with the right to succeed in the see. Before he took his new office, the archbishop, James Roosevelt Bayley, unexpectedly died. The officials of the diocese raised the question whether Dr. Gibbons could take his seat under the circumstances. While they were discussing the point, the ready prelate took possession of the see, and left to the proper authorities the respon­sibility of change. Possession is nine points of the law. This incident illus­trates the character of the cardinal perfectly. He is unassuming and deliber­ate, but gets to his object with remark­able swiftness. To Europeans, Cardinal Gibbons is as well-known as President Roosevelt. As a member of the College of Cardinals he ranks with European princes, and is en­titled to address the Kaiser and the Czar as cousin. His rank cuts off need of explanation. America became more comprehensible to a large group of Europeans When they first heard of the American cardinal. For a long time the eastern world looked upon us with suspicion and contempt—the latter because of our youth, the former because of our principles. The French radicals had undertaken to apply our principles, very badly understood, to their own nation, with some embarrass­ing, not to say frightful results. Undoubtedly the establishment of the Amer­ican republic hastened the spread of democratic ideas in Europe. For this we have not yet been entirely forgiven, ex­cept by those who understand and appre­ciate the vast difference between us and our imitators. It has been the happy privilege of Car­dinal Gibbons to present his country and her citizens in a most favorable light to the princes of Europe. After he had been made cardinal, according to custom, he went to Rome to take formal posses­sion of the church assigned to him. His speech on the occasion was simple but significant, considering the time and the place. He said, in substance, that the Catholic church is not committed to any particular form of government; that she flourishes best in the air of liberty; in America true liberty is enjoyed to the utmost, owing to the beautiful simplic­ity of our form of government; the United States is not only a liberal but a strong nation, and will deal with the diffi­culties of the time as ably and success­fully as the most absolute of monarchies. I presume also to thank him in the name of our separated brethren in America, who, though not sharing our faith, have shown that they are not insensible—indeed, that they are deeply sensible—of the honor conferred upon our common country, and have again and again expressed their warm admiration for the enlightened statesmanship, apostolic virtues, and benevolent character of the illustrious pontiff who now sits in the chair of St. Peter. Europe never really understood us un­til England publicly courted our alliance, and our admirals destroyed the fleets of Spain. Before that time, Cardinal Gib­bons had lost no opportunity to present our political success as worthy of con­sideration, as a solution of European problems, and particularly the problem of church and state. It has been exceedingly difficult to persuade the old world that America had discovered a fair solution of a most irritating problem. The spectacle of so many opposing races and conflicting creeds living side by side in peace does not seem to have impressed the foreigner, but only to have made him suspicious. If ever our success is admit­ted and studied, it will be because of the efforts of the cardinal and his following. Among the many honors which time has conferred upon him, the most novel was his share in the election of Pope Pius X. Cardinal McCloskey of New York failed to get to Rome in time for the conclave which in 1878 elected Leo XIII. So to Cardinal Gibbons falls the honor of being the first American to have a voice in the choosing of a pope. He even figured as a possible candidate in the discussions before the event. There was not the remotest chance of his elec­tion, but the fact is mentioned to show how far European slate-makers had ad­vanced with regard to the United States. As far as may now be gathered con­cerning the conclave, a good number of the cardinals had determined on the elec­tion of a pontiff whose previous career lay outside Rome. They desired a man who had intimate acquaintance with mis­sionary work and very little with courts and cabinets. 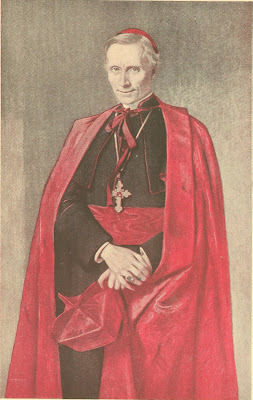 Cardinal Giuseppe Sarto, the Patriarch of Venice, seemed to be the desired leader, and the vote turned to him after the veto of Austria shut out Cardinal Rampolla. The mere thought of being elected frightened Cardinal Sarto. It required the persuasion and advice of his brethren to secure his con­sent; and to this task Cardinal Gibbons lent his influence. The career and the nationality of the Baltimore prelate made him one of the noted figures of the conclave. European journals speculated without end as to his plans, his influence, and his movements. His stay in Paris to visit Cardinal Rich­ard was made the basis of many stories. De Quincey used to tremble in his opium dreams at the phrase "Roman consul." He felt the immense power and dignity of Rome descending upon his heavy slumbers. The vivid French imagination was similarly affected by the phrase "the American cardinal." The vast but unknown power of the young republic seemed to stalk behind James Gibbons. In Europe a cardinal is either caressed by the government, or slowly done to death by torture. He cannot stir from home without alarming the premier. The mere fact that Cardinal Gibbons traveled at his own convenience and pleasure was proof, to the European journalists, that the Federal government owned him as a friend. We smile at these evidences of lack of knowledge, but at the same time we feel like admitting that in another sense the journalists were justified. No man has loved his country more; or rendered her more willing, grateful, and important service than the Baltimore cardinal. Wherever he has gone, in this country or abroad, as a missionary in the wilderness or our representative among princes, he has done credit to his nation by his dig­nity, his prudence in speech and action, and his shining candor. His American eminence deserves the good wishes and the sincerest thanks of his fellow-citizens for representing them so long and so nobly before men.